The Roundtable on Sustainable Palm Oil (RSPO) is a global, multi-stakeholder initiative on sustainable palm oil. Members of RSPO, and participants in its activities come from many different backgrounds, including plantation companies, processors and traders, consumer goods manufacturers and retailers of palm oil products, financial institutions, environmental NGOs and social NGOs, from many countries that produce or use palm oil. The RSPO vision is to “transform the markets by making sustainable palm oil the norm". The RSPO is managed by a Board of Governors comprised of 16 members, designated by the General Assembly for 2 years. To ensure an efficient and progressive management, the Board of Governors is supported by 4 Standing Committees. 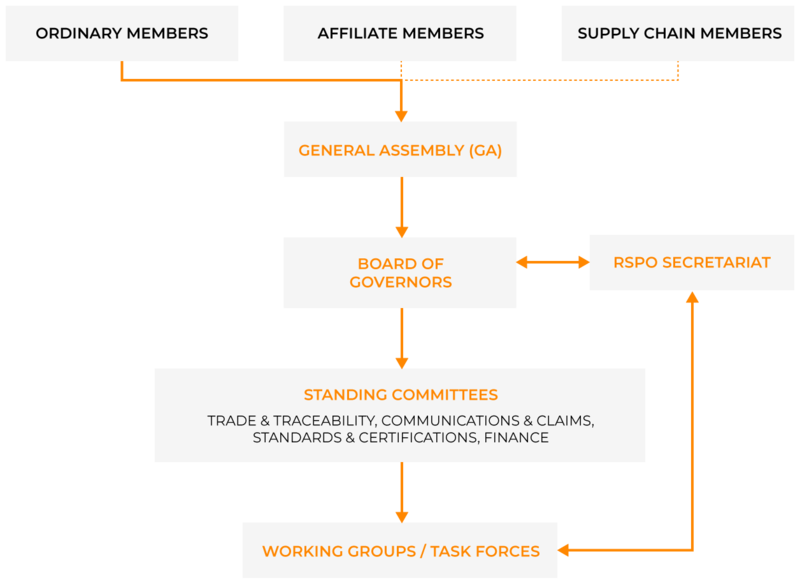 Each Standing Committee is comprised of members from the Board of Governors (including Alternate Board of Governors) as well as RSPO members. The Board of Governors is also supported by advisors. The first Board of Governors was elected at the inaugural General Assembly held on 6 October 2004. Through staggered voting, within each sector, half the Board of Governors is re-elected every year, at the Annual General Assembly of members of the members of the assembly. When a seat is due for election any member in good standing from the particular sector may offer themselves to be elected. Incumbents may offer themselves for re-election or may continue if there are no nominations within their respective categories for the Board of Governor seats. Retailers’ Palm Oil & Soy Groups representative. Sustainable Palm Oil Manager, AAK Netherlands B.V.
Based in Kuala Lumpur, Malaysia, the RSPO Secretariat is in charge of the day-to-day running of the RSPO. Among other, it organizes the RSPO Board of Governors meetings, coordinates the Roundtable meetings and General Assemblies, and services RSPO members. It also coordinates the activities of the Standing Committees and Working Groups. The Secretariat is supported by the RSPO Indonesia Liaison Office (RILO), based in Jakarta.